For over 20 years, Giving Nature has worked with the Central Pennsylvania Farming Community to nurture and create markets for sustainable agriculture. 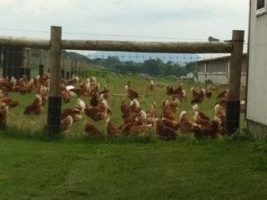 One of the first to bring Certified Organic eggs to our local Mid Atlantic market, Giving Nature’s new initiative is to help create greater public awareness of agricultural activities impact on the Chesapeake Bay Watershed. Most importantly, farming activities that produce animal derived foods like eggs. Watch our website for updates!